Tryouts for the LaRue County High School freshman softball team will be 4-7 p.m. Thursday, June 4, at Lady Hawk Field for girls entering sixth through eighth grade in the 2009-10 school year. Because of KHSAA regulations, ninth graders are not allowed to try out until Feb. 15. For more information, contact Coach Mielle DiStefano at mielle.distefano@larue.kyschools.us. In case of rain, tryouts will be June 17. An Abraham Lincoln memorial, sponsored in part by the Kentucky Abraham Lincoln Bicentennial Commission, will be dedicated at Louisville Waterfront Park from 8:45 p.m. to 9:30 p.m. Thursday, June 4. Gates open at 8 p.m. for the sunset ceremony, which is free and open to the public. On the strength of Truman Padgett's performances, LaRue County recorded five points in the Class 2A Boys' State Track Meet held Friday and Saturday at the University of Louisville’s Owsley Brown Frazier Cardinal Park. Words take on a life of their own. As someone who spends much of his days dealing with language, it’s interesting and sometimes worrisome to see the changes take shape. A recent conversation with my 4-year-old grandson brought one example into focus. We were playing a game of some sort and bumped each other. I instinctively said, “Sorry.” I found his reply surprising. “Sorry don’t butter the biscuits,” he said. Apparently, this is a Southern cliché that he’s learned from his Alabama grandmother. The Senior Citizens Center in Hodgenville offers live music every Saturday beginning at 6:30 p.m. Musicians and singers are welcome. Call 270-358-4311 or e-mail viola47@windstream.net. Pat Helm, LaRue County director of emergency medical services, is retiring effective May 31. Tommy Turner, county judge-executive, said he has had discussions with a possible interim director to take over for Helm, who is retiring with 27 years' service. "The person with whom I met is mulling over whether to take the interim job and will get back to me on it, but regardless, this person is someone that would not be seeking the position on a permanent basis," Turner said during Tuesday's meeting of LaRue Fiscal Court. The LaRue County High School Class of 1989 is having a 20-year “Family Day” reunion 2-5 p.m. July 12 at Sportsman’s Lake. The cost is $20 per family. RSVP by June 1. Send check payable to The LCHS Class of 1989, P.O. Box 104, Hodgenville, Ky. 42748. For more information, call Karen Hawkins Barnes 324-4262 or Tabitha Tucker Ward at 324-3919. Ah, spring on Lincoln Square. Colorful Knockout Roses, sunny daylilies and greenery in the corners, luscious big tea roses and azaleas at the Christian Church, pots of flowers in front of stores and on corners and the pocket park spruced up. Sort of looks like it was planned, doesn’t it? LaRue baseball coach Chris Price wanted to use the last week of the season to take momentum into the district tournament. But the Hawks struggled in their five-game stint defeating only Campbellsville. Price said LaRue struggled defensively at times and wanted to see better hitting. 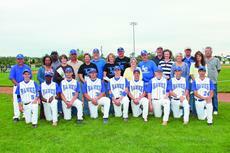 May 11, LaRue visited Campbellsville High School and was stunned in the seventh by a go ahead two run effort 4-3. The LaRue County Extension Service office at 807 Old E’town Road has free handouts on home canning and freezing information. The office can test the accuracy of dial gauge pressure canner lids; bring your lid by the office. Call 358-3401 for more information.